If you teach in Ontario in grade 9, 10 or 11 in one of the following subjects, this "Curriculum Material for the Ontario Curriculum" website will certainly be very valuable for you : Science, Language, Physical Education, Technology, Mathematics, Native Studies. The website contains Unit Plans, Worksheets, Assignments, Organizers, Rubrics, Checklists & Scales, Tests & Exams and more. All the documents and worksheets are available in MS-Word Format, so you can easily modify them to suit the needs of your students. For some of the courses, almost all the units are covered, but some courses are incomplete. 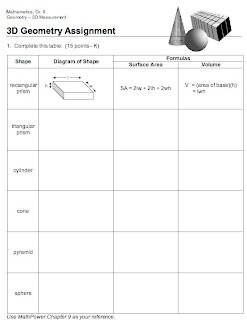 As an example, the geography grade 9 course has over 50 photocopy ready worksheets. Even if you don't teach in Ontario, you may find some documents that will be useful and will match the curriculum in your state, province or country. The term curriculum refers to both general and specific plans for student learning. The most general component of curriculum proposed for Ontario will state the comprehensive results required of graduates, such as being technologically literate. These broad statements will be completed in the first stage of curriculum development. They will ensure that the other more detailed curriculum components are consistent.Curriculum Guidelines and Course Profiles. They will contain clear definitions of the skills, knowledge and attitudes students will develop in particular subjects. In these documents the subject content will be stated clearly enough to assure depth and consistency, while still giving teachers the opportunity to use resources and methods that suit the students they teach. November 12, 2008 at 2:55 a.m. These types of article may help the teachers and also the students.Yeah it has good and nice article. November 26, 2011 at 5:24 a.m.